to which I have distance. for a discussion of the State. I confess this isn’t the only thing I want. The figure of the neighbor allows Levitsky to use the scale of the domestic neighbor relationship and its field of embodied experience and sensory data to think about the scale of the state (by which Levitsky refers both to the US government and to the idea of state power more broadly). Levitsky’s insistence on having conceptual conversations from a place of embodiment aligns with the aims of work in queer geography that takes embodied social practice as central to its explorations of the production of space, an alignment I explore below. I use Levitsky’s engagement with both the figures of “my neighbor” and “the State” to reflect on the scales on which it is possible to live in and think about cities, the independent vectors of somatic information and scalar change, and the visibility that various scales afford. The figure of the neighbor exemplifies the mutually informing relationship between the spatial and the social. It is this spatial-social exchange that geographers Kath Browne, Jason Lim and Gavin Brown identify as central to queer geography in their 2007 edited collection, Geographies of Sexualities: Theories, Practices, Politics. In the volume’s introduction, they note, “everyday spaces are produced through embodied social practices — that is, we are starting with bodies and what they do.” The scale of the neighbor reinforces the embodiment of social practice. The neighborhood — the everyday space occasioned by the figure of the neighbor — has long been the dominant scale in writing about queer urban lives (and often about urban lives and systems more broadly). But the editors go on to suggest other, larger scales that might be read not as abstract systems but as pivoting between material collectivities of bodies and the social forces that organize and impede them. They write, “… these everyday spaces intersect with various other scales of spatiality, including national, international and transnational spaces.” Reading the scale of the state through the embodied neighbor suggests a method of not only starting but also continuing with bodies, reading the body across and between scales. A polyscalar inquiry that retains its commitment to embodiment and to somatic modes of considering the social describes a reading practice that the editors and Levitsky share. On the scale of the home, a domestic neighbor relationship requires material infrastructure, a set of spaces to live in that are proximal or touch. You share sensory data with your neighbors. Sounds and smells travel between apartments and houses. You share a sense of the hyperlocal — of synchronous mail delivery, distance to a public transit stop, or the angle and light density of your interface with the street. Your neighbors might hear you enter your apartment or they might take your laundry out of the washing machine. They might hear you singing or talking or fighting, or examine the package you received in the mail. Neighbors trouble the division between public and private space, and they often have access to their neighbors’ quotidian lives and practices, which can reveal information that makes people on either side of a neighbor relationship feel vulnerable to the possibility of the differing habits and/or social and political orientations. That contrast can produce fear of hostility or violence within or adjacent to domestic spaces. The presence of the baby absorbs the neighbor’s potential energy for caring about the speaker/neighbor. The title of the poem suggests that the neighbor’s performance of motherhood (and her failure to be interested in neighborliness) is bound up in expressions of national identity through compulsory heterosexuality, which risks privileging a familial unit to the exclusion of other viable forms of collectivity, as between neighbors. Decisions produce the city. If you live in a city, each time you leave your house, you generate an aggregated imaginary of what you’re going out into. Living in a city requires an active and shifting imaginary — a scalar elision between the parts of the city you can see and the other parts that you include or exclude (purposefully or by accident) from your urban imaginary. The inability to decide on a city, to identify a fixed way of thinking about the city, is a condition of living in urban space. When the housing changes in the poem, the process of trying to decide on a city pivots decisively toward its future. Changes to housing have for decades been the center of conversations about urban decline and its complex reversal in gentrification. In the neoliberal city, the scales of that future need to be somatic and global simultaneously. As geographer Neil Smith notes, “The causes and effects of gentrification are also complex in terms of scale. While the process is clearly evident at the neighborhood scale it also represents an integral dimension of global restructuring.” A commitment to reading relationships to changing urban spaces as somatic processes can start with the neighborhood, where it’s easy to see bodies and how they interact. Individual bodies and embodied relationships tend to be harder to see at larger scales. But Smith’s framing suggests that urban residents can use what they see in the neighborhood to identify gentrification’s causes and effects across scales. In cities, the theoretical scalar unit (global system, rather than neighborhood) can shift separately from its material instantiation (interaction between neighbors, in the case of Levitsky’s poems). Put differently, the scale on which to read the city can usefully be a separate decision from whether and how to consider the sensory data of being in urban space. To live in a city is to simultaneously experience the smell of your block and its enmeshment in exchanges of global capital. But whose bodies get to register their somatic urban experiences is a question that is also crucial to formal experiments in how to use its sensory input to represent multiple synchronous and intersecting scales of urban life, a question that Levitsky’s queer, female speaker raises throughout the poems. Shifting theoretical and material scales separately suggest that the exploration of even a very small urban system (like a New York apartment building) can be variously or multiply a local, regional, national, and/or globally situated line of inquiry. How might queer practices of reading that maintain a focus on embodied experience use this focus to offer different models for joining the theoretical concerns of larger scales to the somatic detail of individual quotidian lives? What might those embodied and embedded polyscalar readings look like? What version of urban futures might those readings and their practices produce? 1. Rachel Levitsky, Neighbor (Brooklyn: Ugly Duckling Presse, 2009), 14. 3. Kath Browne, Jason Lim, and Gavin Brown, Geographies of Sexualities: Theory, Practices and Politics (Farnham, UK: Ashgate, 2007), 3. 4. Browne, Lim, and Brown, 3. 5. 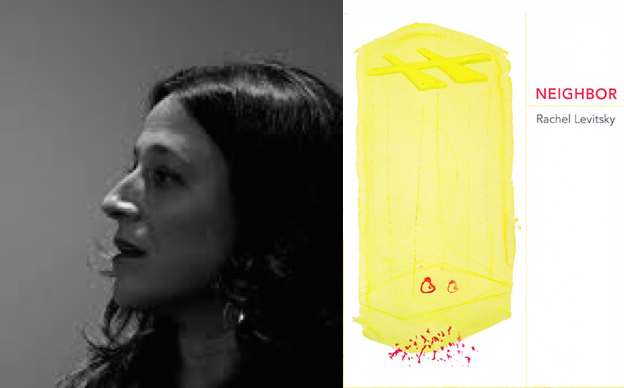 In April 2017, Rachel Levitsky and I had a conversation in the Wexler Studio at the Kelly Writers House about sexuality, neighbors, and spatial queerness. That conversation is available here. 9. Neil Smith, New Urban Frontier: Gentrification and the Revanchist City (Abingdon, UK: Routledge, 1996), 51.